Cross Axis Pipe and Tube Straightener machines are utilized for removing straightness defects from formed or extruded pipe. These machines operate by using multiple stations of crossed parabolic work rolls to straighten pipe. These machines may be as stand-alone pieces of equipment used for processing individual pipes or incorporated into full processing lines used for cut-to-length tube lines. Rotary pipe and tube straighteners are designed with a variety of roll configurations. 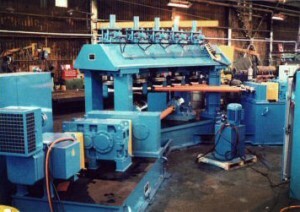 In the 1970’s, the five and six-roll machine became the standard for pipe straightening. Element later that decade then came out with their innovative and technologically superior seven roll design. The Element design employs large cross sectional post dimensions for rigidity and a robust upper roll assembly to resist deflection. The lower rolls are driven with a single motor and drivetrain through a distribution box and the upper rolls much the same. Element’s brand of pipe straightener has two large bottom rolls that pivot 20 degrees in either clockwise or counter-clockwise rotation and five smaller top rolls that independently traverse up and down to contact the O.D. of the pipe. All rolls are driven and Element’s unique advancement allows for fast quill response in the top rolls for straightening upset ends in the oil and gas industries. Our computerized process makes set ups far easier than those machines of old and allows for many changes per shift for higher production yields. The main advantage of the seven roll design is the addition of what the industry defines as a “bending moment”. This is where the majority of the straightening is accomplished. In a seven roll design, there are three bends that occur. This pyramidal roll configuration allows for tremendous deflection of the pipe and allows for gradual tapering of the amount of work required as the pipe enters and exits the straightener. By bending the pipe into the plasticity zone, without work hardening the material, it enables the badly shaped pipe and tube to be straightened even if the incoming pipe is out of straightness on all three planes, X, Y & Z. The most common condition coming into the pipe straightener is a pipe shaped like a banana. This occurs during the welding process whereas the weld zone shrinks causing the pipe to pull up on itself creating the curvature. A seven roll design can also minimize ovality issues that sometimes plague extruded pipe because the profile of the straightener tooling inversely induces rounding to the pipe as well. The straightness of heads and tails of pipe are also improved by having more bending moments in a Element Pipe Straightener. When Element designs a pipe straightener for an end-user, great care is taken in the selection of materials; ie. roll alloy, forging ratio, hardness, finish, etc. An improperly hardened and ground roll set will not completely straighten pipe and tube as the intended curvature cut into the rolls will wear more rapidly and also mar the surface of the pipe as you attempt to overwork the material to compensate. Our rolls are EAF (electric arc furnace), static induction hardened alloy material that is ground to a mirror finish for a superior hardened case depth that will allow for many years of life and regrinds. The most important factor in roll design is the hyperbolic roll curvature (http://en.wikipedia.org/wiki/Hyperbola). Determining these complex angles are based on the matrix of pipe diameters to be straightened, as all straightening machines are designed with a nominal, minimum and maximum working diameter. There is a great misconception that the complete smooth surface of the hyperbolic roll contacts the outside diameter of the pipe. In fact, only three points of each bending roll make contact with the pipe to be straightened. The very middle inside radius and two very outside radii contact the pipe. The designed shape of the roll allows it to accommodate many pipe diameters, which is accomplished by adjusting the roll gap (adjustment of top rolls) and angle (pivoting of the bottom rolls).